How important is friendship? I've always been taught that friends are able to make our lives more balanced and happy. 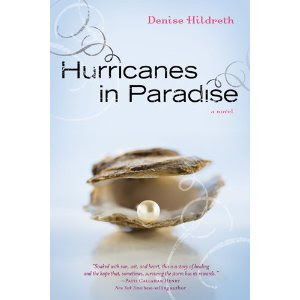 "Hurricanes in Paradise" by Denise Hildreth is about four women, Laine, Winnie, Tamyra and Riley, who meet in the Bahamas during a vacation. Before their trip to the islands these women did not know one another. Their friendships are new and serendipitous. Perhaps, miraculous is the word. After all, the life journey of each one became less heavy after they met one another in Paradise. Like in all friendships there is anger, misunderstandings, laughter, tears and the revealing of secrets. Behind all of these emotions is a "healing" of body and mind. The first person to mention a "healing" is Roy Rogers, a man who meets each woman at the airport. Who is Roy Rogers? I have my idea. You might have a different idea. I'll say he is an ethereal person.